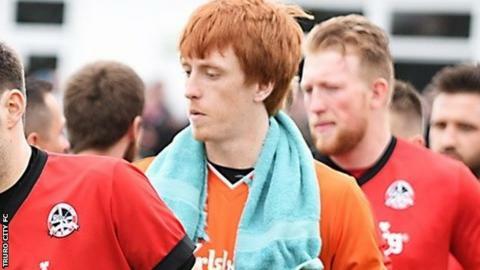 Truro City boss Steve Tully faces a tough decision over which goalkeeper to select for the club's next match. First-choice keeper Martin Rice has missed the last three games after breaking his finger, but the club have remained unbeaten with youngster Tom McHale deputising for him. "It's given me a decision to make for next weekend," Tully said. "Tom's come in, he's never played at this level before, and in the three games he's played we're undefeated. McHale played 13 times for Truro last season and was part of the side that won the Southern League play-offs to gain promotion to National League South. "I think Tom will learn from this experience," Tully told BBC Radio Cornwall. "He's got a bright future ahead of him and we'll look after him."